It’s hard to believe that it’s been more than 25 years since the Space Shuttle Challenger exploded 73 seconds after launch. I was watching TV that morning before I went to my job as the Undergraduate English Secretary at the University of Michigan. Much of the country was watching TV on January 28, 1986. Among the crew members was Christa McAuliffe, who’d won the honor to be the first Teacher in Space. She represented the opportunity for normal people to go into space. Her death marked the end of that dream for most people. 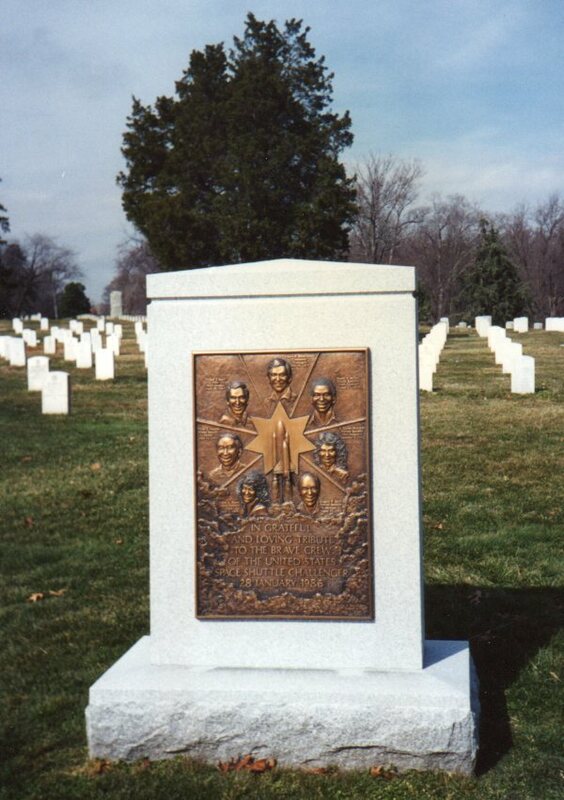 On June 12, 1986, Congress resolved that “the Secretary of the Army should construct and place in Arlington National Cemetery a memorial marker honoring the seven members of the crew of the Space Shuttle Challenger.” Artist Robert Harding designed the bronze plaque on the front of the monument. John Gillespie Magee Jr.’s poem “High Flight” is inscribed on the memorial’s back. Some of the Challenger crewmembers’ remains could be identified and were buried in private graves. Everything that could not be identified using 1980s technology was cremated and is buried in the base of this monument. Vice President George Bush dedicated the monument on March 21, 1987. Family members of the seven Challenger astronauts, along with a small crowd of 400 other people, attended. This entry was posted in Famous person's grave, Photo Challenges and tagged Arlington National Cemetery, epitaphs, military cemetery, postaweek2011, postaweek2012, Space Shuttle Challenger Memorial. Bookmark the permalink. Debra, your comments always brighten my day. Thank you for taking the trouble to write. what a shocking moment that was. an unforgettable launch that ended in tragedy. hard to believe it has already been so long ago. thank you for sharing this poignant post. So glad you liked it! I was very surprised it happened so long ago, since I remember the moment so clearly. So sad to remember that moment of tragedy i was watching it too that time on TV Nice to remember them . I was teaching in quite a rough school at the time. One of the kids I taught who had a degree of learning difficulties was called McAuliffe. He was taking a very personal interest in this shuttle because of the shared name. Thus hers is the only one I remember. Wow. That must have been a difficult time for you as a teacher! I’ll never forget that moment, much like the plane hitting the twin towers. It’s hard to believe it was 25 years ago! Excellent post. I hadn’t thought of the Challenger disaster that way, but it feels exactly right. I had such a complete sense of disbelief when both events happened.